…helps hamburger help her. Remember that? Am I showing my age? So it’s 5:30 pm. You just remembered that you have to feed your family, again. You haven’t thought about what to eat, but somehow you feel guilty throwing frozen fish sticks and a bag of cheetos at them. You have that frozen brick of ground beef burning a hole in your freezer. I have your answer. This is the pinch-hit you need on your repetoire when you are very low on the gaf-meter, but not low enough to call for pizza. This is the easiest one-pot meal you can make and you don’t even need one of those insta machines to do it. You have everything you need in your freezer and fridge right now. Cheese. Lots of shredded cheese. Get out a big pot. Sauté the onion in a few tbsps of oil. 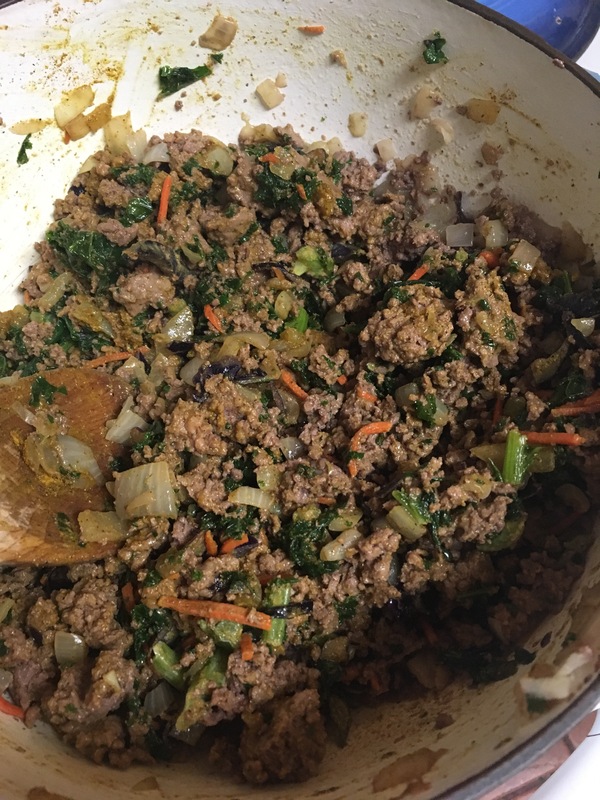 Add the ground beef and kale. (If beef is frozen, you’ll want to defrost it in the mike for a few minutes.) Brown the beef. Add salt, pepper, garlic powder, cumin and curry…stir frequently until it’s all cooked. Stir in a large handful of shredded cheese. Notes: Honestly you can pick any spice here…you can be pretty creative. This is a great time to try out one of those spice combos they’ve come out with: Rogan Josh, Ras-el-Hanout, Southwestern Ranch, etc. Anything will be good. Season heavily: about a tablespoon of spice per pound of meat. Bowl it up, and top with as much cheese as you like. 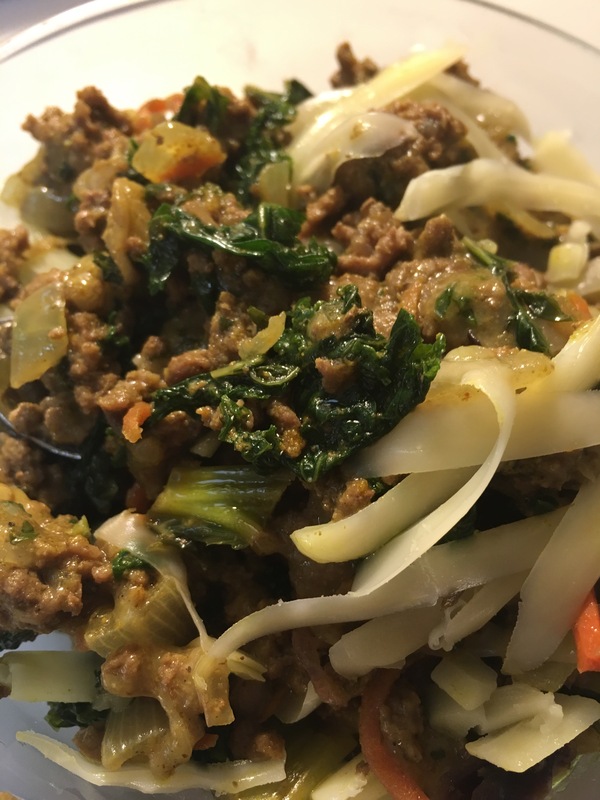 **I buy fresh chopped kale in the salad section, and freeze it for smoothies or “Hamburger Helper” night. It is about 5 cups. Bam. Just fed the family…took 14 minutes. Eating healthy does not mean you also have to be creative every night, too. 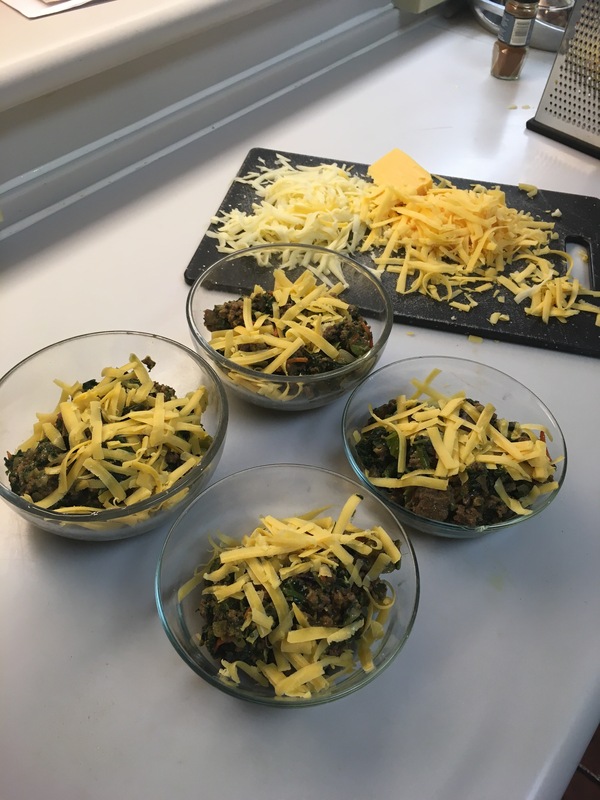 This is a skeleton of a recipe…consider topping it with a fried egg, or using the leftovers in a breakfast scramble, in egg cupcakes, or throw it in a couple cups of bone broth for a filling soup. For another easy grab-the-hamburger dinner, check out these Creamy Curry Meatballs. If you have these five ingredients…. please move next door to me….or down the street!